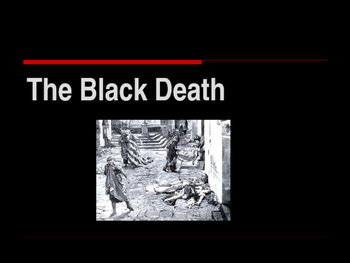 This is a 14 slide, highly animated, power point presentation on The Middle Ages: The Black Death. 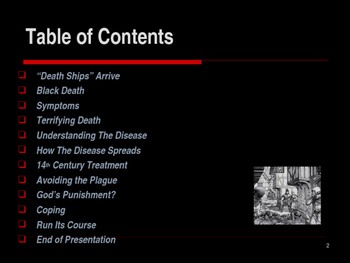 All the slides are editable so you can modify the slides if you need to. 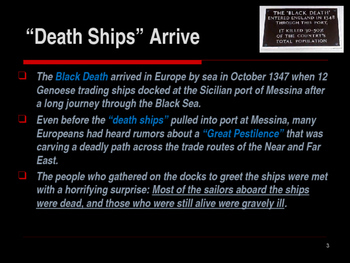 The Black Death arrived in Europe by sea in October 1347 when 12 Genoese trading ships docked at the Sicilian port of Messina after a long journey through the Black Sea. The people who gathered on the docks to greet the ships were met with a horrifying surprise: Most of the sailors aboard the ships were dead, and those who were still alive were gravely ill. 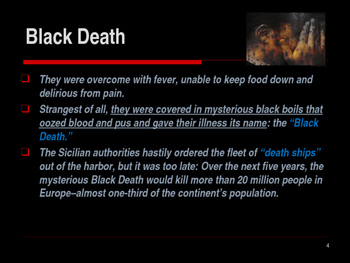 The Sicilian authorities hastily ordered the fleet of “death ships” out of the harbor, but it was too late: Over the next five years, the mysterious Black Death would kill more than 20 million people in Europe–almost one-third of the continent’s population. NOTE: DUE TO THE NATURE OF THE SUBJECT, SOME PICTURES MAY BE TO GRAPHIC FOR SOME.